Yep, this is extreme and quite degrading. Two men in Suzhou China ran over a dog with their car, the owner requested $5000 RMB payment for the death of his poodle. The two men in the car don’t have that kind of money to fork over, so the dog owner told them they could choose to kneel next to the dog’s corpse for an hour. 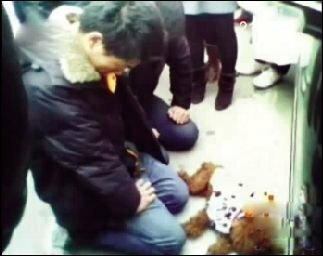 Surrounded by curious onlookers, the two men kneeled over a dead toy poodle in a shirt for an hour to the dismay and outcry of spectators, the media, and netizens across China. Many feel that the dog owner has gone too far and it is very degrading for two grown and capable men to be kneeling over a dead dog. Many feel that these two men have been lowered in the ranks of species and ridiculous to be kneeling (which is interpreted as mourning and paying respects) for a dog. This public showcase of kneeling has gained alot of outcry and disapproval because men in China are taught at an early age they need to be strong and could not cry to show weakness. Most importantly, those knees are very strong and capable, and under no circumstances should a man ever kneel down. There is a Chinese saying that says “under the knees of a man lays gold”. These two kneeling men are causing such a stir that police are summoned to the scene while onlookers tried convincing the two men to stand up and stop kneeling. To the astonishment of onlookers, the two kneeling men continued kneeling and requested the police not to get involved. They mentioned they could not stand up right now because they have not been kneeling for 60 minutes. When the hour is finally up, the dog owner took the corpse away, but this incidence has caused such a stir that even the mayor of Suzhou province issued a statement on his website denouncing this act of degradation. It turned out the dog owner publicly apologized for crossing the line with his action. As a dog owner and a dog lover, I would be sad to see my dog be involved in such an accident, but I wouldn’t expect the people who caused the accident to kneel over my dog’s body for an hour. I would most certainly be angry and probably yell at them for awhile, but I would not request them to kneel as a form of compensation. I would call the police and expect remorse, and I would expect them to deal with the costs associated for properly allocating the corpse, but I would not request them to kneel.